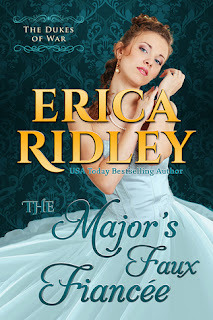 This is my favorite Erica Ridley historical romance thus far. The others I read in the Dukes of War series were lighter and fluffier. I used words like "quick" and "fun read" to describe them in past reviews. The Major's Faux Fiancee isn't light, fluffy, or fun. Don't get me wrong. This book is great, but it's far more serious than the other offerings in the series. Daphne and Bartholomew are flawed characters who work through some pretty big issues while falling for each other. Daphne is a bleeding heart who wants to solve every social issue and improve the lives of those less fortunate (following her dead father's example). And Bartholomew struggles with the guilt of persuading his brother to go to war with him and then being "unable to save him." He's also got some serious confidence issues because he returned home with an amputated leg. See? Big issues. While making London believe in their fake betrothal, Daphne gives Bartholomew back his confidence and makes him resolve his guilt. In turn, Bartholomew and being in London helps Daphne realize her heart might not have been in the right place for her charity work. The couple grows together and improves as individuals for a lovely, touching read. The Major's Faux Fiancee proves Ms. Ridley is capable of writing romances (and characters) with wonderful depth. 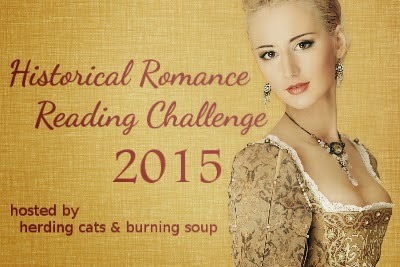 Challenge Update: This is book five toward the Historical Romance challenge! It's always great to find historical romances like that, you made me quite curious! Ooo that sounds like my kind of read! How would it work as a stand alone? Starting with this one is fine. The characters from the other books appear, but not knowing what happened to them isn't a problem for the plot of this one. It's either your thing or it's not. Historicals are very much my thing! Sounds like a great book! I'm not much for historicals (at all), but these reviews are slowly puling me towards trying one again. But seriously, you gotta read what you like reading. Don't let me persuade you. This series totally appeals to my reading senses. I have the first book, but am putting it off until the holidays since it has a Christmas setting. Lovely review.